BENNY: Yo! I am Benny, a domestic shorthair blend about 3 months old. I was taken to Palm Valley Animal Center as a stray with other brothers and sisters. I was a little scared when I was brought back to The Laurie P. Andrews PAWS Center at first, but it just took me some time to not be too scared. I also love to roll around in catnip. I will warm up quickly in a new home. I love to be with other kittens and I don’t mind some small dogs. 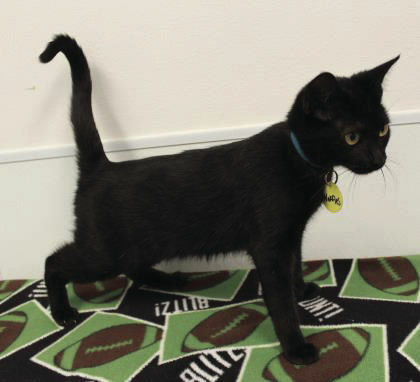 Come on over today to play with me in our community kitten room so you can fall for me and take me home. HERSHEY: Hi! 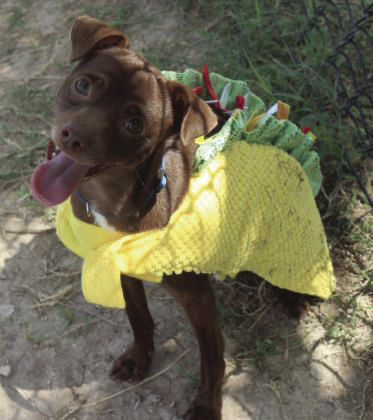 My name is Hershey, I am a Chihuahua blend about 11 months old, weighing in at about 12 pounds of love. I was found as a stray by Animal Control in Edinburg. I am an active boy who loves to play all day long. I do not mind being around other dogs that are my size. I seem to do best with a family that has small dogs already. I really do not like to be alone. I also like being in a loving lap all day as well! So come on over and give me the chance at another loving home that I very much deserve. I promise I won’t give you a reason to give up on me, please. MOLLY: Hey yall! My name is Molly, a Dachshund blend about 3 years old. I weigh around 12 pounds of love. 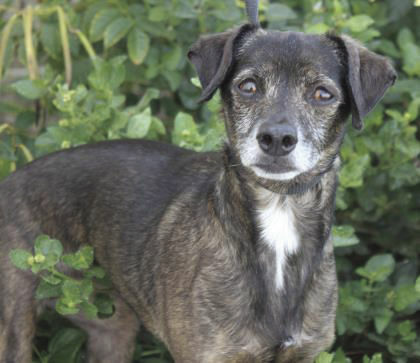 I was taken to Palm Valley Animal Center as an owner surrender because I like to chase animals. I am a quiet girl, and not considered your hyper Dachshund. I mean, don’t get me wrong, I like to play with other dogs and people, but I prefer to just lounge around and sit on your lap. As you can tell from my picture, I have really big ears! Teehee!! I love for people to massage them. Please come visit me! I deserve a loving, forever home! MUNCHKIN: Hello! My name is Munchkin. 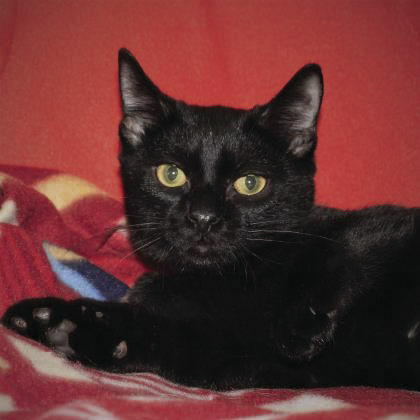 I am a domestic shorthair blend about 5 months old. I was taken to Palm Valley Animal Center by animal control. I’m glad I was brought here to be given this second chance, since sometimes that’s all it takes to find a forever home. I am a cuddle bug, so be prepared to get your face loved by me. I love to play all day with the other kittens. Come on over today to see me roar!! I will be waiting impatiently for you. TYLER: Whazzup!!! I’m Tyler! A Shepherd blend about 1 year old, weighing in at about 46 pounds of awesomeness! I came to the shelter August 11th of this year as a stray. I know I look like a lot to handle, but all I want to do is walk around the Dog Park or neighborhood with my future family. I would be considered kennel trained, since I do not cry at all in my kennel. I do love to play with other dogs my size. I would be considered a medium active boy. I just need about a half hour outside to keep my energy levels on track. Come on over today to see how awesome I really am! I can’t wait to meet you!! WAFFLES: Hiya! 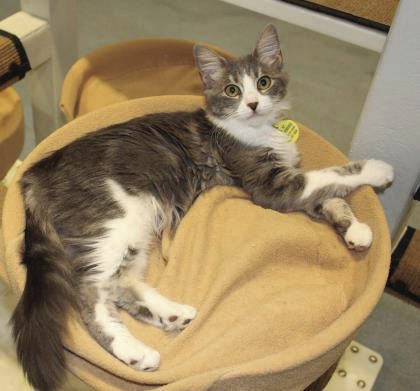 I am Waffles, a domestic shorthair blend about 6 months old. I was surrendered by my owners because I and my siblings were an unwanted litter. I have been with The Laurie P. Andrews PAWS Center since August. I am a very good boy. I love to be with people all the time. I’m currently in our cat condo area because I have not been neutered yet. I love being picked up and cuddled. I also like to be with other cats. I have this one friend in here that I love to play fight with, her name is Molly. Maybe you can take us both? Okay, well, I will be here waiting for you to take me to my house! Adoption fees include the first series of shots, spay/neuter operation, microchip and a month of pet accident insurance. 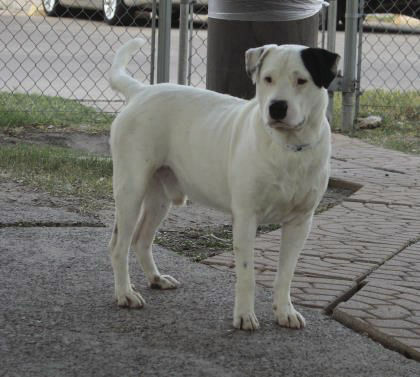 For more information on adopting Hershey, Tyler, Molly, Benny, Munchkin, Waffles, or any of our other adoptable pets, visit The Laurie P. Andrews PAWS Center in Edinburg or call (956) 720-4563 today. You can also see a list of all our adoptable animals’ 24-hours a day at pvaconline.com.